A man wears a blue, sleeveless telnyashka at a Victory Day celebration in Donetsk. The Russian telnyashka (Russian: тельня́шка, IPA: [tʲɪlʲˈnʲaʂkə]) is an undershirt horizontally striped in white and various colors and which may be sleeveless. It is an iconic uniform garment worn by the Russian Navy, the Russian Airborne Troops (VDV) and the Russian marines. Dating back to the 19th century Tsarist Navy, it was subsequently worn by the Soviet successors of these troops. Russian paratroopers wear telnyashkas on parade. The official uniforms of Naval, Airborne and Naval Infantry personnel do not include conventional shirts. Open fronted jackets of various designs make the distinctively striped telnyashka a conspicuous part of the clothing of these different branches of the Russian armed forces. Telnyashkas are also available to civilian customers and may come in a variety of knittings. Single-stranded knitting is the standard military-issue variant, but double- and quadruple-stranded knitting for increased warmth can be produced. A quadruple-stranded telnyashka is thick enough to keep the wearer warm with nothing else on, even at 5 °C (41 °F), as it was originally developed to be worn by military divers under a dry suit. Soviet special forces wear telnyashkas with Afghanka battle dress during the War in Afghanistan. The Russian telnyashka originated in the distinctive striped marinière blouse worn by merchant sailors and fishermen of Brittany, who adopted this style to distinguish them from other sea-going nationalities. The fashion was later adopted and popularized by the French Navy and other navies of the pre-dreadnought era. Sailors of the modern French Navy still wear these garments in certain orders of dress. The Imperial Russian Navy adopted the blue and white striped telnyashka blouse during the 19th century. 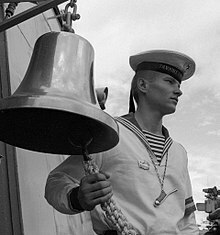 The tradition of Russian or Soviet ground troops wearing a naval uniform comes from Soviet Navy sailors who fought as shore units during World War II. It is exemplified by the famed Soviet sniper Vassili Zaitsev, a petty officer in the Soviet Pacific Fleet who volunteered for army duty, but refused to give up his telnyashka because of the pride it engendered. Vasily Margelov, who was later to modernize the Soviet Airborne Forces (VDV), had previously served with a Naval Infantry unit in World War II, and procured telnyashkas for the VDV as a mark of their elite status. The Bulgarian 68-th Special Forces Brigade uses the telnyashka as part of its uniform. Russian marines parade in navy blue dress uniform, with a matching navy blue telnyashka. Former servicemen wear green telnyashkas during Border Guard's Day celebration in Russia. Soviet 1936 propaganda film We Are from Kronstadt [ru] started aestheticization of telnyashka with a scene of a Bolshevik sailor emerging from the sea in his torn undershirt after surviving an attempted execution by drowning. The telnyashka is worn by a number of popular non-military characters of cinema and children's cartoons, notably The Wolf in Nu, pogodi and Matroskin the Cat in Troe iz Prostokvashino. The telnyashka is worn by members of various factions in the 2019 video game Metro Exodus. There is a popular saying: "We are few in number, but we wear telnyashkas!" (Russian: Нас мало, но мы в тельняшках!, translit. Nas malo, no my v telnyashkakh! ), referring to the military prowess of Soviet sailors in land operations during the Great Patriotic War. Zaitsev, Vassili. "Notes of a Russian Sniper." Trans. David Givens, Peter Kornakov, Konstantin Kornakov. Ed. Neil Orkent. Los Angeles: 2826 Press Inc., 2003. This page was last edited on 7 April 2019, at 19:02 (UTC).